The 2018 holiday shopping season is shaping up to be one of the biggest ever. Maybe the biggest ever. With holiday shoppers presently spending billions on gifts for their loved ones, Field Agent sent agents to three major retail chains on Tuesday to see who’s selling popular holiday gifts—from L.O.L. Surprise! dolls to KitchenAid mixers—at the lowest price. 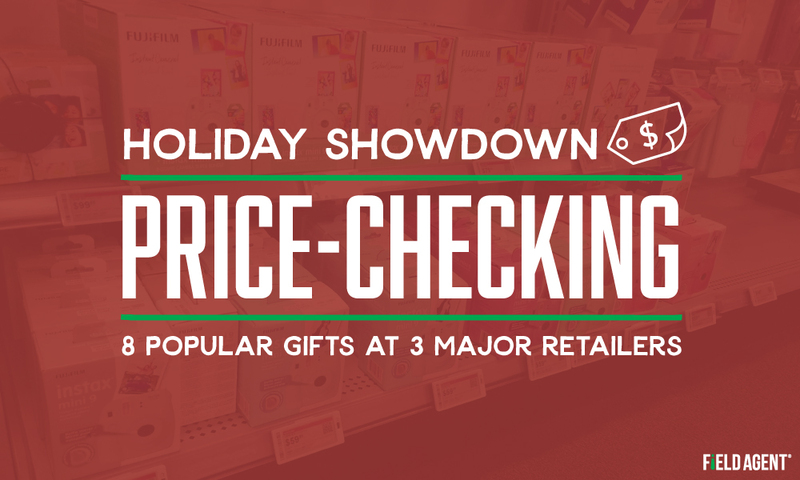 And considering out-of-stocks are a more pervasive problem this time of year, we also took the opportunity to collect some stock-level information on hot gift items. 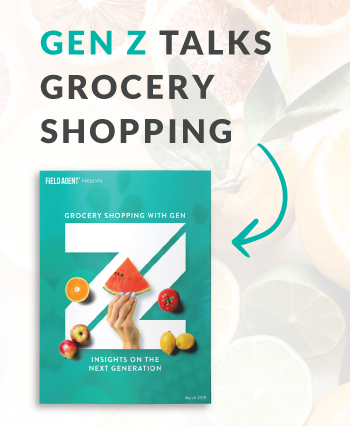 We then sent agents to 42 different stores across three national retail chains (Best Buy, Target, and Walmart) to collect pricing and inventory data, including photos, entirely through the Field Agent app. For each retail chain, agents audited at least 12 different stores. 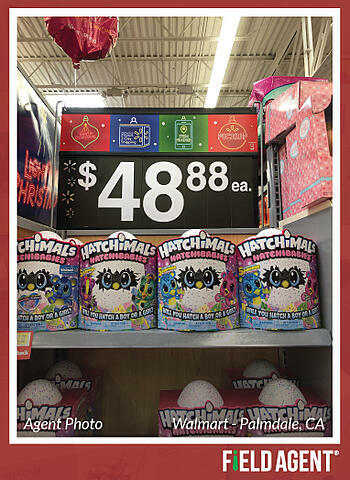 While in-store, agents were instructed to take two photos per product: one with the price tag visible (price-check photo) and one showing available inventory (stock-level photo). (2) How much inventory/stock is available for this item? Below we present the results product-by-product. It should be noted, the dollar amounts below reflect the most frequently-reported prices for each retail chain (i.e., the mode price). In other words, of the 12+ stores audited per retailer, we display the price our agents encountered most regularly. 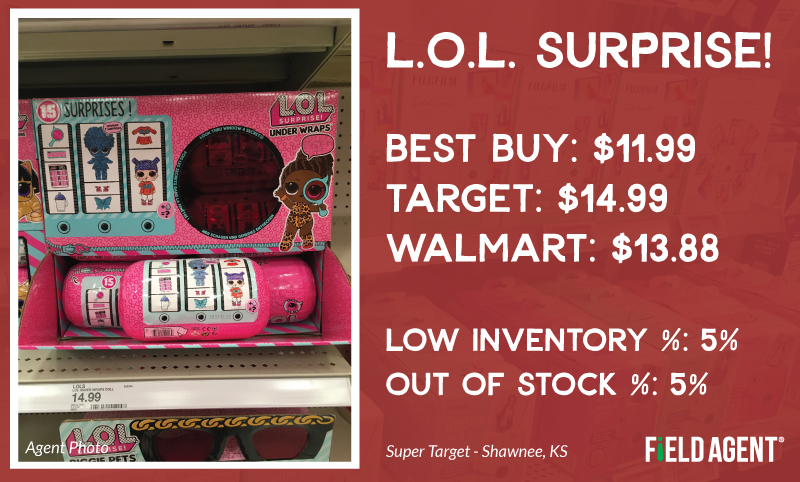 Moreover, the "low inventory %" and "out of stock %" reflect the percentage of audited stores (42 in all) with only "1-2 units available" and "no units available," respectively. Naturally some products (e.g., KitchenAid mixers) are larger than others, and, thus, retailers may only be able to keep a few units on-shelf. They’re cute. They’re cuddly. They’re…really popular this holiday season. 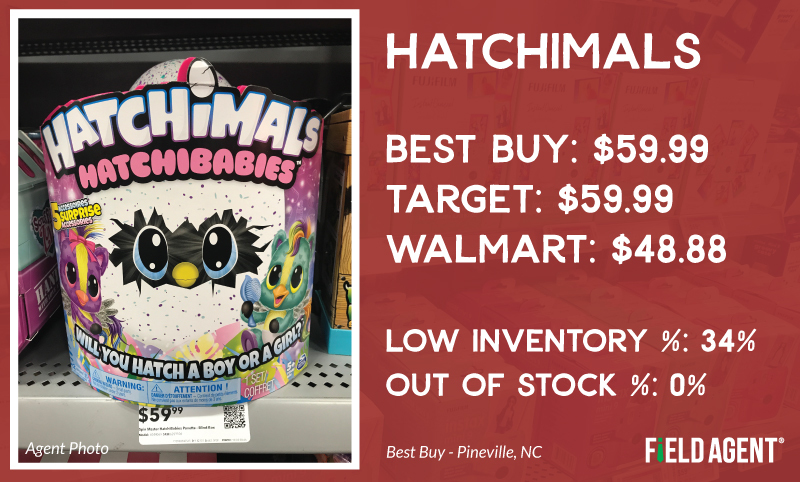 Hatchimals HatchiBabies are popping up, no pun intended, at retailers everywhere, including electronics giant (and newfound toy store) Best Buy. 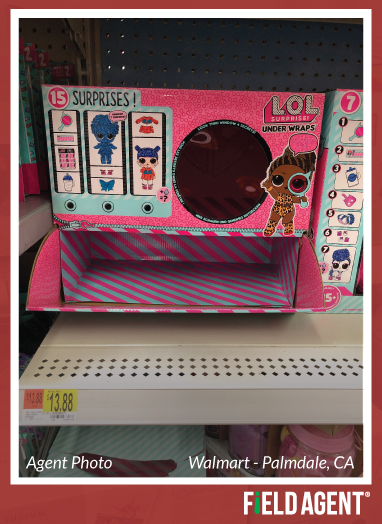 Named 2018 Toy of the Year by the Toy Association, L.O.L. Surprise! Dolls generated some $4 billion in annual, worldwide sales prior to December. And, the toy created a few YouTube "unboxing" stars along the way. Year after year, Nerf is a big hit with the kiddos. As detailed in our recently updated and expanded Toys Report, Field Agent asked 632 boys ages 5-12 to rank 7 toy franchises by “how good they are as holiday gifts.” Fully 36% of boys ranked Nerf #1, more than any other franchise, even powerhouse LEGO (27%). 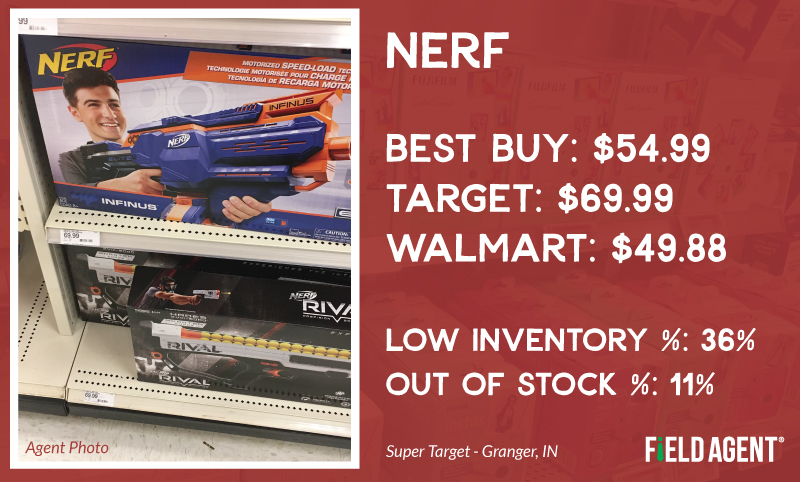 Nerf’s Infinus model, carried widely by retailers, is bound to make its way under many Christmas trees this year. The holidays are prime time for video game makers and sellers. 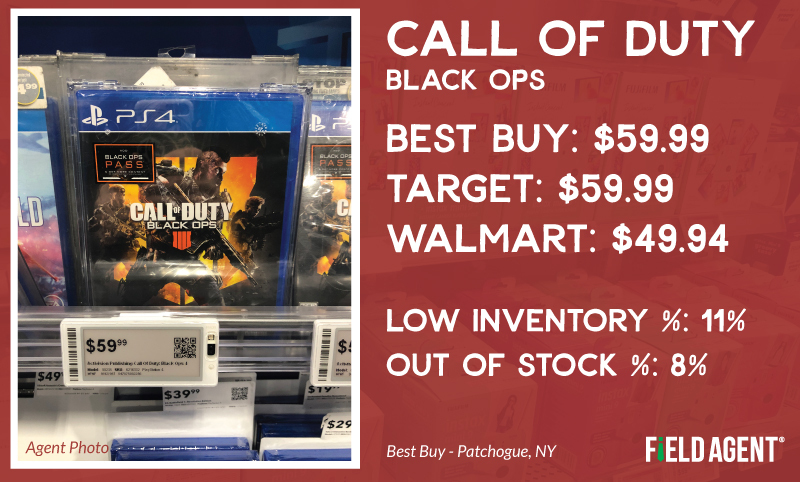 And this year, the latest installment in the Call of Duty series, Black Ops 4, looks to benefit from the hero-shooter wave propelled by Fortnite. The instant film-and-camera rage continues. 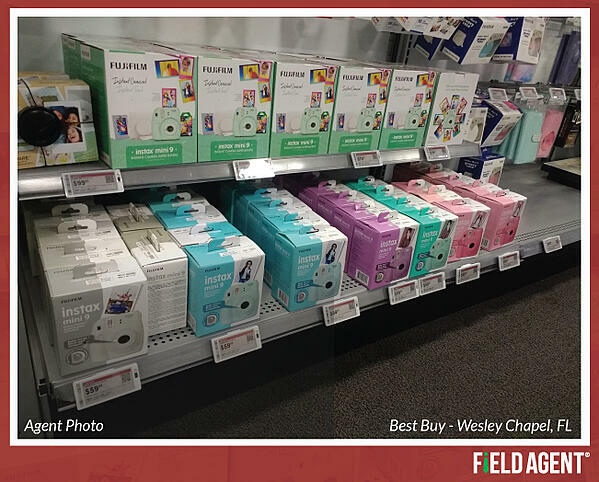 Fujifilm’s Instax Mini 9 should be a particularly popular gift this Christmas. 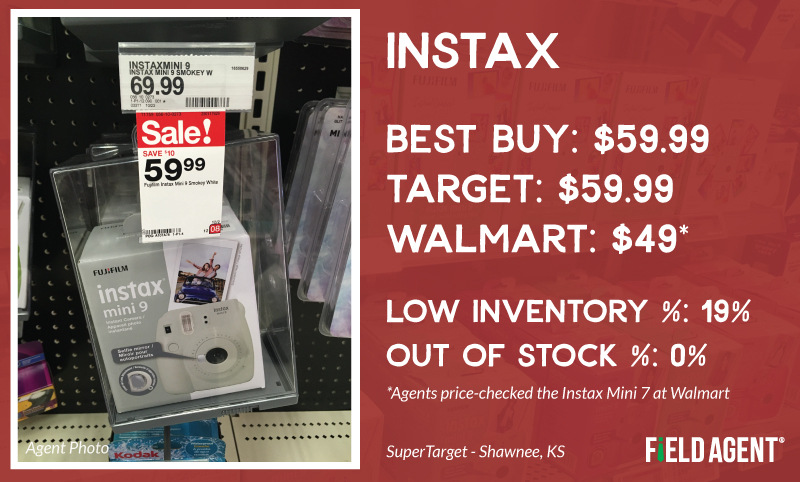 In our audit, Target and Best Buy were both heavily stocking the Mini 9, while most agents were unable to find the 9 at Walmart, where they reported large quantities of the Mini 7 instead. As Field Agent’s holiday report shows year after year, electronics are always among adults’ top gift-wishes. 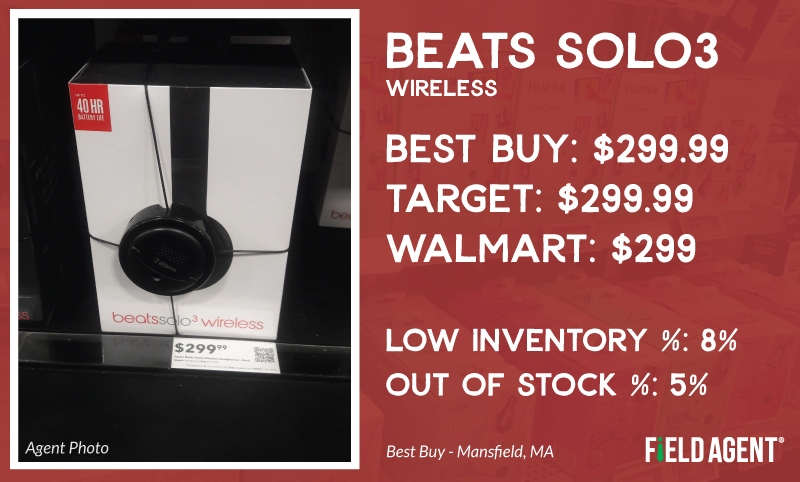 And Solo3 wireless headphones, a Beats by Dre product, are on display in many electronics departments this holiday season. Our agents audited the on-ear model. What has a screen, knows your name, and can control your thermostat? 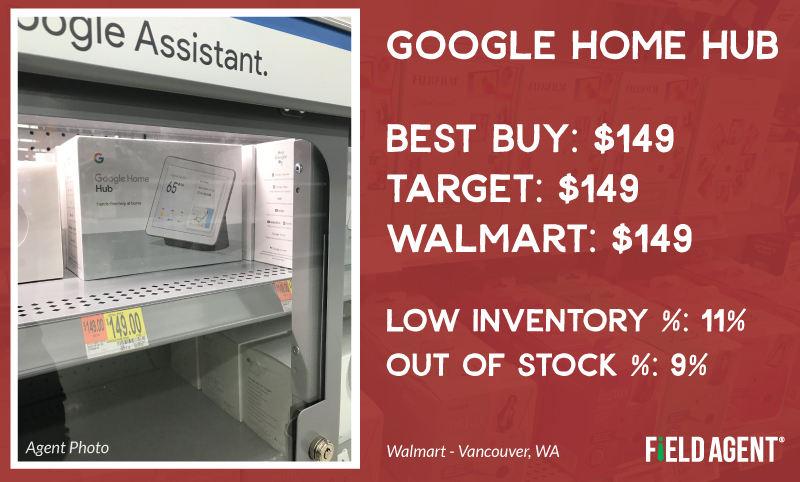 The Google Home Hub was consistently marked with the same price across all three retailers in our audit. For the last few years, KitchenAid mixers have been among women’s most widely-requested gift wishes, as our 2018 holiday report once again shows. 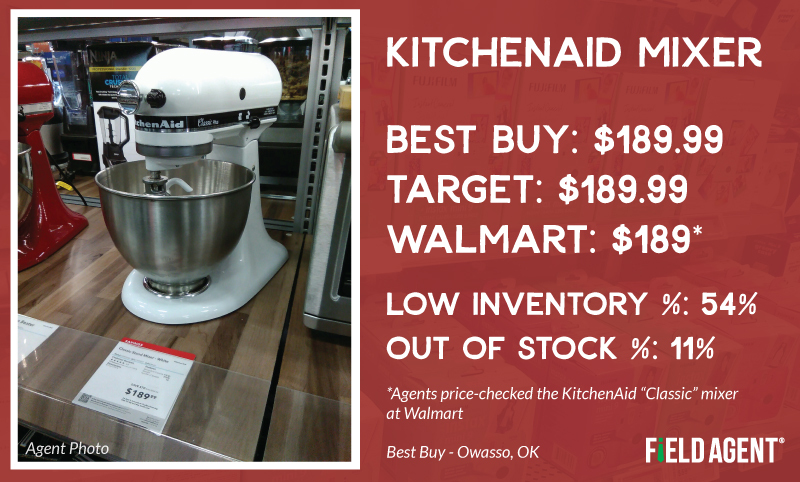 We asked agents to check prices and stock-levels for the most “basic” KitchenAid mixer carried by Best Buy, Target, and Walmart. At Best Buy and Target, this was generally the “Classic Plus” model, while at Walmart it was the “Classic” model. Field Agent’s 2018 holiday insights report, “An Old-Fashioned, Omnichannel Christmas,” is still available for free download! 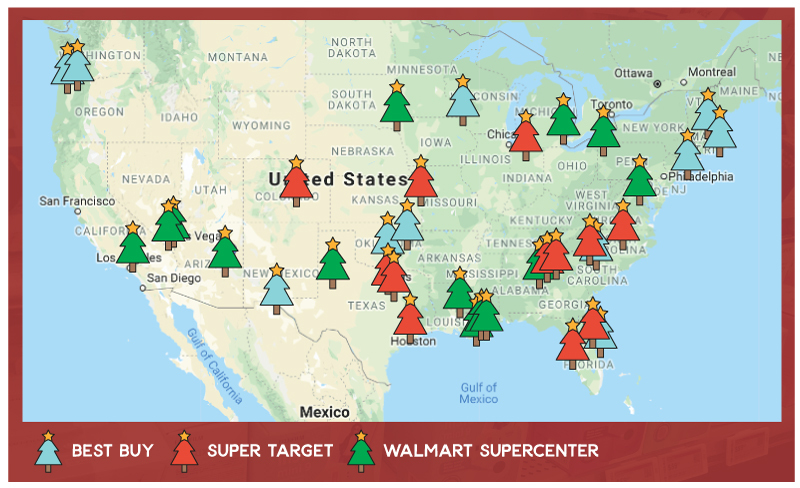 From surveys with thousands of shoppers, this popular report offers an in-depth look at the plans and expectations of this year's holiday shoppers, including what gifts they're buying, where they're buying them, and how they're buying them.